Available as low as $2.59 per round over spot! The Atlantis Mint is well-known for the production of hand-poured and hand-stamped silver bars, but the mint now has a new product lineup that offers variety while sticking to the use of hand-poured procedures. The skull and crossbones design Atlantis commonly uses is now featured on silver rounds and a silver square. The 1 oz Silver Atlantis Skull and Crossbones Hand-Poured Round is now available to you online for purchase at Silver.com. Rounds ship to you inside of protective flips! 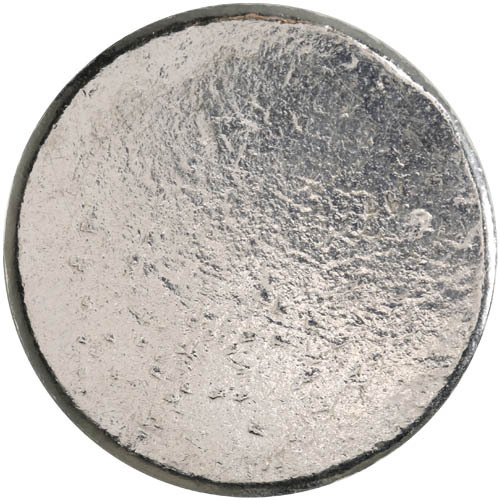 All-new silver round product from Atlantis Mint! On the obverse side is the design of the skull and crossbones. Reverse side of the rounds is blank. All products hand-poured and hand-stamped. The symbol of the skull and crossbones is an ancient one that is most commonly associated with death. Beginning in the Late Middle Ages, its use expanded from the macabre to become a popular military insignia. Units of professional soldiers and pirates alike would use the skull and crossbones on flags as a warning to others about their ferocity. In the modern era, the skull and crossbones is most commonly used to signify poisonous or otherwise hazardous threats. In 1829, the state of New York required labeling of poisonous substances and the skull and crossbones quickly became the go-to symbol. There are two common ways that the image is depicted. The Atlantis Mint uses the most common form on its silver products, that of a human skull with two long bones crossing behind the skull. Some designs will place the crossed bones below the skull and not obstructed by it. On the obverse of these 1 oz Silver Atlantis Skull and Crossbones Hand-Poured Rounds is the design of the skull and crossbones. 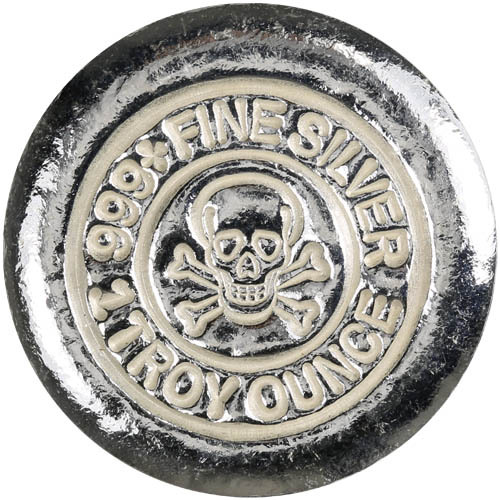 The image is hand-stamped into the center of the silver rounds with inscriptions around it that read “999+ Fine Silver” and “1 Troy Ounce.” The rounds have rough edges with a blank reverse surface. No two rounds look exactly the same because of the hand-stamped process that ensures the design elements are not uniform from one round to the next. These 1 oz Silver Atlantis Skull and Crossbones Hand-Poured Rounds are available to purchase inside of protective plastic flips. Silver rounds are a great alternative for those looking for silver products that have lower premiums over the spot price and greater availability. We encourage Silver.com customers to reach out to us with questions at 888-989-7223. You can also connect with us online through our live chat or email us directly.